Serpent Gates layout. Shows you where all the teleport pads lead you to. Latest addition. Bugs of the Black Gate and the Serpent Isle. Work in progress. A file showing the locations of the serpent teeth in Serpent Isle. A document of useful information of Ultima VII plus other games. Provides lots of things you may not know in the game. Has lots of information and neatly organised. TEXT file. Serpent Isle Easter Eggs. Tells you how to activate the endgame scene without finishing the game plus a couple of easter eggs. Another Easter Eggs of the Ultima games. This document provides all the eggs in the Ultima Series. Has lots of eggs though for Ultima VII. Got a question? Check out this FAQ which could quickly bring your doubts to a stop. 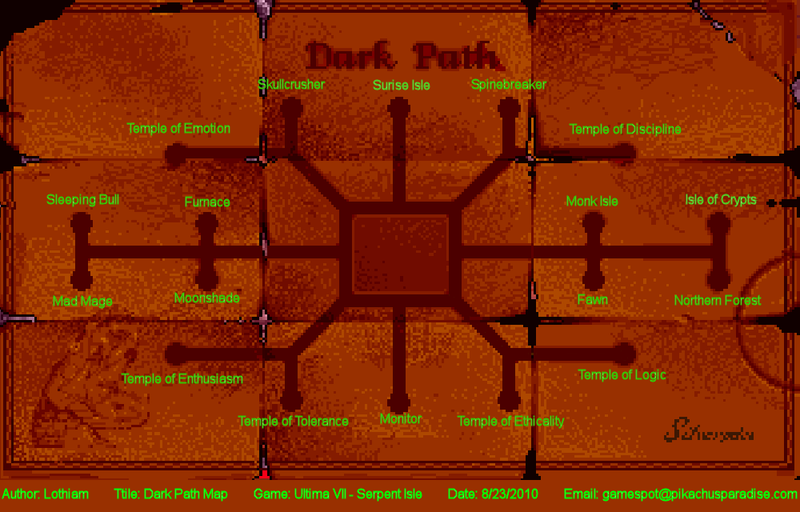 Containing some tips and the locations of where your items taken by the lightning are found, it comes complete with a map of the Serpent Gates. Answers 5 most-asked common questions for Serpent Isle. Extracted from Origin's Website. This document contains Hints and Tips to get the game going. It also has references to Serpent Isle, but, also comes with the FAQ, which may answer your questions. Ever wanted to keep books of Serpent Isle in your finger tips instead of your memory? Grab this document and print it out! Has every book and scroll found in the game. Tells you what number to press to create a certain item using the cheat menu. Tells you what number to press to create a certain item using the cheat menu. Includes Silver Seed add-on items as well. Creates permanent light in Serpent Isle. No more nights! If you want to change, say Lucilla, to a goblin using the cheat mode, this text file tells you what number to press for that sprite. Tells you the Cheat room location and the cheat code to get access to Serpent Isle's secret menus. This file, which comes with Universal Game Trainer, allows you to change you and your party members' attributes. It also supports the whole Ultima Series (I-VIII) and Underworlds (I, II). This document explains how to start the cheat mode and also ID numbers of useful items, descriptions of them and more.